3/16" Crown. 20-Gauge "R" Series Staples. 1" Length. Capacity 170. The lightweight SLS20HF tongue-and-groove installation stapler drives 1" to 1-1/8" staples at a perfect 45° angle every time and virtually eliminates tongue splitting and floor surface damage. Its front block easily adjusts for different floor thicknesses, while the industry-exclusive safety ensures accurate staple placement. 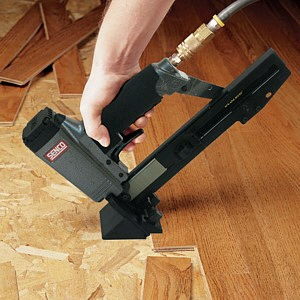 This tool installs pre-finished tongue-in-groove products (1/4", 5/16", 3/8") and some of the 1/2" flooring brands. * Please call us with any questions about our tongue groove stapler air in Mason OH, Westchester OH and Cincinnati metro area.